Following two types of motors are widely used for crane duty applications. The crane motors are duty type rated for developing high starting torque with low starting current. The motors are designed to withstand stresses due to frequent starts/stops and reversals. Also, a rapid acceleration is achieved by high pull out torque/rotor inertia ratio. Generally, the motors assigned duty type S3, S4 and S5 are considered for crane applications. The crane duty motors are specially designed to offer satisfactory performance and long lives for service on the cranes and hoists. These motors may also be used for similar applications such as material handling, sluice operation on dams/weirs, lifts of all types and in rolling mills as auxiliary motors or wherever operating drives are required for intermittent services. In accordance with the provisions made in the applicable Indian Standard, the motors should be able to perform satisfactorily for the power supply parameters, site conditions and insulation class as provided in Table.2, unless specific parameters are furnished. The rated output of motor specified by the vendor is generally at 40°C ambient temperature. For temperatures other than 40°C, a duration factor should be applied as indicated Table.3. The technical and constructional features of crane duty motors as follows are more or less similar to that are found in the standard continuous duty motors. Specific technical and constructional features required to be incorporated in the specification for the crane duty motors are listed hereunder so that the motors provide desired trouble free, predetermined and optimum performance. The motor rating should be decided based on its thermal capability taking into consideration few or all factors listed hereunder as per duty requirements. It is vital to specify the correctly calculated “Cyclic Duty Factor” (CDF) for crane duty motors. Calculations for deriving CDF for type duty S3, S4 and S5 are given in succeeding paragraphs for reference. The motors should have higher than normal pullout torques. As the motors are supposed to experience large no. of starts, it is necessary that the accelerating time of the system should be as small as possible. The higher pull out torque ensures rapid acceleration irrespective of drop in effective torque due to stepped rotor resistance. Moreover for minimizing acceleration time, total inertia of the system, comprising of moment of inertia of motor plus moment of inertia of load, should be minimum. This can be achieved by keeping lower than normal rotor inertia in comparison to standard continuous duty motors. The torque available from the motor varies as the square of the motor terminal voltage, an allowance for voltage drop in long cables, live rails and collectors must be considered. The voltage drop is significant when the motor is operated at pull out torque point, since current at this point is much higher than the rated current. The motors should be able to withstand 1.5 times the rated current for 2 minutes without suffering damage. This feature makes the motor suitable for intermittent and severe duties experienced on the crane or similar applications. All 4, 6, 8, and 10 pole motors should be designed for withstanding an overspeed of 2.5 times rated synchronous speed or minimum 2000 rpm, whichever is less. The squirrel cage motors should be provided single cylindrical shaft extension and the wound rotor (slip ring) motors should be provided double cylindrical shaft extension. The stator and rotor windings should be impregnated with Class ‘F’ thermosetting varnish insulation. In stringent cases, Class ‘H’ insulation may also be considered. Additionally, the rotor windings should be braced with resin-glass banding to give protection against centrifugal forces experienced by overhang during overspeed and frequent reversals. Gel-coat may be painted on the winding overhang for better consolidation and protection from vibration. Size of the terminal box should be adequate for to facilitate splitting of power cables cores and terminate comfortably. In slip ring motors, the cables for main power supply and from slip rings are usually accommodated in the same terminal box for simplifying wiring and maintenance. Hence in case of slip ring as well as squirrel cage motors, if required, the cable box size may be increased by providing an attachment of cable splitter box (generally of trapezoidal shape) to the main terminal box. The rotors of squirrel cage and wound rotor motors should be dynamically balanced to ensure lowest possible vibration. It should be preferred to use the metallic cooling fans in the wound rotor motors. PVC or plastic fans are likely to be deformed due to high temperature in housing due to slip rings and get damaged. As the motor would generate more heat due to intermittent switching operations, the painting should be heat resistant, specifically able to withstand higher temperatures. The standard crane duty motors should be provided IP55 Degree of protection as per IS:4691. The cooling code of motor should be IC411 as per IS:6362. The insulation resistance of the slip-ring unit should be high enough ensuring minimum wear and breakdown. The brush holders, made as a complete unit, should be easily replaceable. The slip-ring should be large enough to encounter starting currents and for proper installation of brushes in slip ring motors. The enclosure for slip-rings should be dustproof and easily accessible for inspection. For higher rated would rotor motors, separate disc should be provide between the slip-ring and rotor windings to prevent ingress of carbon dust from brushes into windings. Working as Electrical Engineering Consultant located at Vadodara, India providing System Design & Engineering services to various industries, possessing 40 years of experience in diversified industries and consultancy. Very informative. 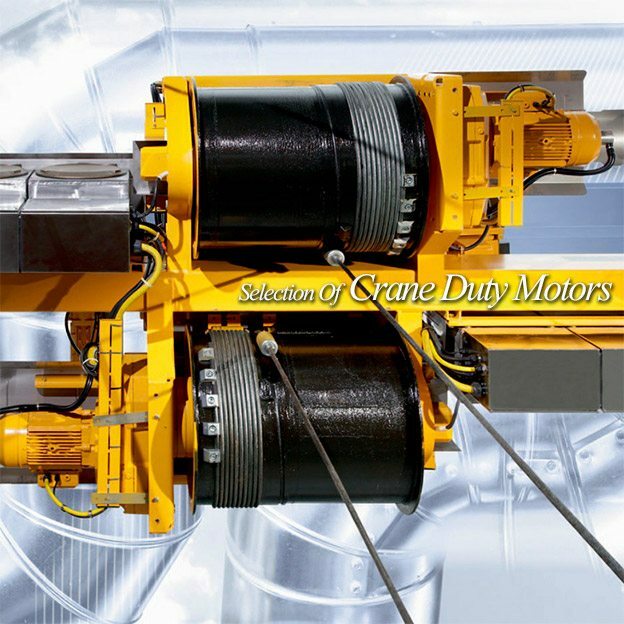 This is very helpful information for choosing the right duty crane motor.